L’Allegro, il Penseroso ed il Moderato is the most joyful work I’ve seen on stage this year. 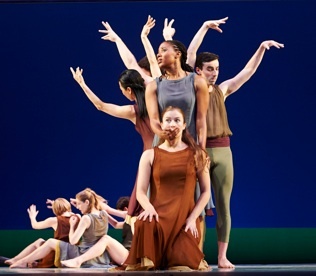 American choreographer Mark Morris premiered this masterpiece in 1988 in Brussels. We owe a great debt of thanks to Luminato for bringing this work to Toronto for its Canadian premiere twenty-five years later. It is an exhilarating feast for the eyes and ears that restores your faith in humanity. L’Allegro and Il Penseroso are two pastoral poems from 1645 by John Milton about contrasting personalities – the happy man and the contemplative man. Charles Jennens, who would later be the librettist for Handel’s Messiah, had the idea of not presenting the two poems sequentially but mingling sections of the two to create a dialogue. To these he added a third personality, Il Moderato (“the moderate man”) as a mean between the two extremes. While the original libretto gives Il Moderato the last word, Morris appropriately gives it to L’Allegro, who concludes singing, “These delights if thou canst give, Mirth, with thee we mean to live”. Jennens’ libretto with the text divided among four soloists and a chorus Handel set to music in 1740. 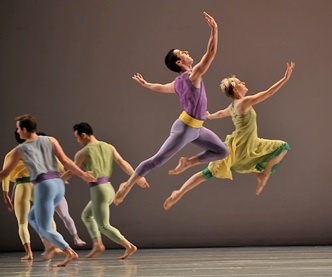 Mark Morris used this oratorio as the basis for his first full-length ballet. Pastoral poetry depicts humanity, in the guise of shepherds and shepherdesses, living at one with nature and the change of seasons with disputes over love their only care. In Shakespeare’s As You Like It the court flees into the Forest of Arden to live just such a pastoral life complete with the jovial personality of Touchstone and the melancholy personality of Jacques. Morris creates a modern form of pastoral by celebrating the egalitarianism of the genre inherent in the vision of men and women doing the same work. He choreographs the piece for an ensemble of twelve men and twelve women, with no one elevated above the rest as a featured premier danseur or prima ballerina. In group dances no one is habitually in the back row or in the front row. Rather every dancer has a turn in the limelight. More than this, Morris does away with traditional male versus female dance roles. If dancers pair off, men will as likely pair off with men, and women with women, as men with women. The same applies in lifts. Men lift women, women lift men, men lift men and women lift women. At the end of one sequence all the female dancers lift the male dancers and carry them into the wings. In another sequence to Il Penseroso’s words “Then as I wake, sweet music breathe, / Above, about, or underneath”, Morris satirizes male attitudes. In two concentric rings the male dancers first hug, then slap each other, then pose while one ring slaps the bums of the men in the other as if in some frat ritual. Then they reverse roles before tiptoeing off in haughty pairs. You won’t see this in conventional ballet, but that’s the point. Morris’s choreography conveys such a buoyant sense of freedom because it breaks all the traditional hierarchical and gender-restricted rules of classical ballet. The general hallmark of Morris’s choreography is a simplicity that conceals difficulty. The very beginning of the ballet is based simply on running. Two lines run diagonally across the stage intersecting at a midpoint, but though running faster and faster, miraculously never collide. Later, in Part The Second, walking is the focus, with two chains of dancers entering the stage diagonally opposite each other, processing directly towards each other with collision immanent before veering away from each other at the last moment. The patterns the two mirroring meandering chains make across the stage beautifully illustrate Il Moderato’s words, “Each action will derive new grace / From order, measure, time, and place”. In Morris apparent complexity is the product of the building up of simple units. A small group of dancers will begin a series of actions – such as evoking through sequential gestures prayer, Gothic arches and contemplation during the chorus “There let the pealing organ blow” – and continue to repeat its sequence, each time joined by another group who, as in a fugue, begin their sequence just after the first group has begun its repeat. Eventually the stage is filled with several groups who at any moment are all at different stages of completing the same sequence. At the same time this additive technique reflects the contrapuntal nature of Handel’s music. Just as Handel so often uses image-painting in his music, Morris has the dancers’ gestural language reflect the words. In L’Allegro’s air “Come , thou goddess fair and free”, the dancers make beckoning gestures on the word “come” in the first line and self-crowning gestures on the word “ivy-crowned” in the last. While most of Morris’s scenes embody the mood of the music, a few set out to depict the picture the words depict. In L’Allegro’s air about the lark, “Mirth, admit me of thy crew”, dancers mime opening their windows to hear the lark (Dallas McMurray with undulating arms worthy of a Tchaikovskian swan). In Il Penseroso’s subsequent air about the nightingale, “Sweet bird, that shun’st the noise of folly” that speaks of the disappearance of birds, Morris has his company depict a starling-like crowd of birds veering in different directions before they fly off. Throughout this air dancers who had been doing lifts to help their partners “fly” begin appearing, still doing the lifting motion, but gradually missing their partners until none appear. The gradual loss is perfect for the melancholy view Il Penseroso expresses. The most humorous depiction of all is Morris’s choreography of L’Allegro’s air about hunting “Mirth admit me to thy crew! To listen how the hounds and horn”. Here some dancers become the trees and bushes of the scenery, while two other become the deer trying to hide and the rest become the dogs, hornsman and aristocratic couple hunting them down. Morris includes numerous comic details like one of the hounds lifting his leg on the bushes. What makes this so endearing is the childlike naiveté that Morris captures that is clearly present in Handel’s own imitative passages. All in all, L’Allegro amounts to a postmodern take on the 18th-century pastoral. The Greek Arcadia was home to all these shepherds and shepherdesses, but costume designer Christine Van Loon, clothes the dancers with a simplicity that matches Morris’s choreography. Men and women are clad in a palette of pastels that recalls painting of Watteau and Fragonard (men not excluded from wearing pink). The women wear flowing knee-length waist shifts with an undershift in a contrasting colour while the men wear tights and a short tunic tucked into a sash in a contrasting colour. These tunics are the clearest reference to classic Greek costume, but the men’s tops vary in the same way as the women’s – one-shouldered, slit long-sleeved, short-sleeved and sleeveless. All the dancers are barefoot. For Part the Second, they change into even deeper pastels. Adrianne Lobel recalls 18th-century theatre by constructing a set made up of legs and twenty moving scrims and drops. These do not depict scenes as in the 18th-century, but are in solid pastel colours that echo the colours of the costumes. When one drop with evenly-spaced squares falls in front of another, we have the abstract depiction of the city spoken of by Il Penseroso and the Chorus in “Populous cities please us then”. When night falls, an all-black drop is lowered halfway down over the stage. Morris often has the downstage scrims act as mirrors. A couple or group will dance in front of the scrim only to be mirrored by one or more couples or groups behind it. The dancers are so precisely coordinated that the effect is uncanny. The orchestra for the performance was the impeccable Tafelmusik Baroque Orchestra under the baton of British conductor Jane Glover. The tempi were brisk without a loss of expressivity. The one question was how the sound of the 34-member orchestra and 25-member Tafelmusik Chamber Choir could possibly be heard in all the immensity of the Sony Centre. The four soloists were tenor Thomas Cooley, soprano Karina Gauvin, soprano Shannon Mercer and baritone Douglas Williams. All gave vivid accounts of their various roles, though Gauvin’s words, unlike the others’, were not ideally distinct. The combination of Handel’s exultant music so beautifully played and the dancers’ precise yet exuberant performances turned the evening into a celebration of community and all that is best in humankind. L’Allegro is one of those rare creations that effortlessly draws an audience upwards into bliss. Photo: (top) The cast in a chain dance; (middle) Two cast member in flight. ©2010 Ken Friedman; (bottom) Two deer hide behind a tree. ©2013 David Leyes.